I will introduce Japanese archeological artifacts designated as National Treasure. The archeological artifacts are from Jomon era to Heian era. Jomon pottery is the first pottery made 13,000 years ago in Japan. It is called Jomon (rope pattern) because the rope pattern were designed on the surface of the pottery. The beauty of the form of this pottery is one of the most remarkable ones among the world primitive pottery. Radioactive carbon dating tells that it is the world oldest pottery. 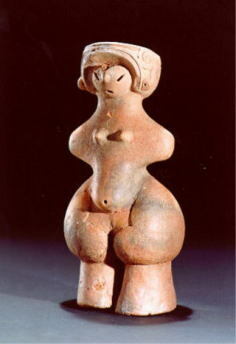 The clay figures of this period were also excavated which is considered to be used for ceremony. In this period, the shape and decoration of pottery became simple. Bronze bells also started to be made which was used for the ceremony for 400 years from B.C.2nd century. The size of bell varied from 12cm to more than 1m. In this period, Kofun (burial mound) called Zenpokoenfun (Keyhole shaped burial mound) made all over Japan and many articles were excavated. Haniwa, the clay figure, is the characteristic of this period. Other than human figures, animals like horse, arms, houses were made. It is said that these fugures were used for funeral of the lord, or these articles express the ceremony when the lord was alive. Mirrors, iron swords were also excavated. Buddhism was imported in this period, so there are many articles related to Buddhism. Bussokuseki is a curved footprint of Buddha in stone. It was thought to be shame to make Buddha's figure for 300-400 years after his death. Chindangu are the artiles to be buried before builidng temples for purifying the land. 7 riches (gold, silver, pearl, crystal, amber, lapis lazuli, agate), mirrors and swords were buried because these articles were believed to have magic power to protect from devil. In thie period, Zen sect culture came from China became poplular, but at the same time they reconsidered their own culture. Many of the articles of National Treasure were found at Kyozuka which is a ruin where Buddhist scriptures were buried. Scriptures are mainly written on the paper but sometimes written on clay board, copper board, stone, tile or shell. Scripture was kept in the metal cylindrical container and inscription was engraved on it. Also, foreign articles like Chinese copper mirror are designated as National Treasure.